Despite losing his mask in 1999, Super Astro started wearing in the mid to late 2000s. He claims he was never paid by the promoter for losing his mask, so he has the right to continue wearing it. In at least one occasion, the commission objected to this. In that situation, Super Astro circumvented regulations by calling himself Meteorito while wearing his usual mask and gear. Super Astro has also used the name Aeorlito Humano for the same purposes. He even used the name of Kid Dynamo, but he was recognized. 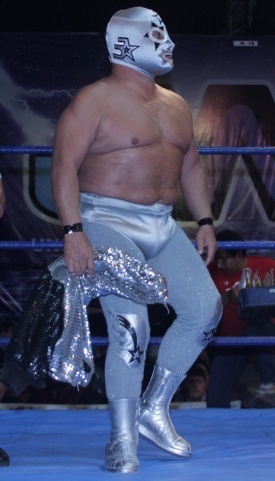 Current CMLL wrestler Valiente has often spoke being inspired to become a wrestler by Super Astro. Valiente and Super Astro have similar builds and styles. With la Super Torta "El Gladiador"
In his cafeteria "El Cuadrilatero"
This page was last edited on 22 April 2019, at 21:11.